Irish (Gaelic) Fáilte, Tá fáilte romhat (sg) / romhaibh (pl), Fáilte romhat isteach! (Welcome here! ), Cead míle fáilte (hundred thousand welcomes), Afrikaans Welkom, Albanian Mirë se vjen, Arabic (Egyptian) (ahlan wa sahlan) أهلاً و سهلاً , Arabic (Modern Standard) (ahlan wa sahlan) أهلاً و سهلاً , Armenian (Eastern) Բարի գալուստ! (Bari galu'st), Armenian (Western) Բարի՜ եկաք: (Pari yegak), Aromanian Ghini vinit! (plural) Ghini vinishi! (singular), Azerbaijani Xoş gəlmişsiniz!, Basque Ongi etorri, Batak Menjuah-juah! Horas!, Belarusian Вiтаем (Bitaem - We greet you),Прывiтанне (Pryvitańne - Greetings) , Bengali স্বাগতম (shagotom), Bhojpuri स्वागत बा (swagat ba), Bosnian Dobrodošli, Breton Degemer mat, Bulgarian Добре дошъл dobre došãl) >1m, Добре дошла (dobre došla) >1f, Добре дошли (dobre došli) >pl, Добре заварил (dobre zavaril) <1m, Добре заварила (dobre zavarila) <1f, Добре заварили (dobre zavarili) < pl, Добре дошло (dobre došlo), Catalan Benvingut (>m), Benvinguda (>f), Benvinguts (pl), Benvingudes (pl/f), Cebuano Maayong pag-abot, Chamorro Bien binidu / Buen binidu, Chechen марша вагIийла хьо (m), марша йагIийла хьо (f), марша дагIийла шу (pl), Chinese (Cantonese) 歡迎 (fùnyìhng), Chinese (Hakka) 歡迎 (fon2 ngiang2), Chinese (Mandarin) 歡迎光臨 [欢迎光临] (huānyíng guānglín), Chinese (Taiwanese) 歡迎光臨 (hoan-geng5-kong-lim5), Cornish Dynnargh dhis, Corsican Bonavinuta, Croatian Dobrodošli, Czech Vítáme tĕ (sg/inf) Vítáme vás (pl/frm), Danish Velkommen, Dutch Welkom, Efik A me di o, Esperanto Bonvenon, Estonian Tere tulemast, Ewe Woezor, Faroese Vælkomin, Finnish Tervetuloa, French Bienvenue, Friulian Agradît / Benvignût, Galician Benvido/a, German Willkommen, Georgian კეთილი იყოს თქვენი / შენი მობრძანება, (kethili iqos tk'veni / sheni mobrdzaneba), Greek Καλώς Ορίσατε (Kalós orísate) – frm,Καλώς Όρισες (Kalós órises) – inf, Καλώς Ήλθατε (kalós ílthate) – frm,Καλώς Ήλθες (kalós ílthes) – inf,Καλώς Ήρθατε (kalós írthate) – frm,Καλώς Ήρθες (kalós írthes) – inf, Greenlandic Tikilluarit / Tikilluaritsi, Guaraní Eguahé porá, Gujarati પધારો (padhāro), Hawaiian Aloha, Hebrew (baruch haba) ברוך הבא, pl - (bruchim ha-baim) ברוכים הבאים, Hindi स्वागत (svāgat) सवागत हैं (svāgat haiṅ), Hungarian Üdvözlet, Icelandic Velkomin (>m) Velkominn (>f), Igbo nno̱, Indonesian Selamat dating, Iñupiaq Qaimarutin, Inuktitut ᑐᙵᓱ (Tunngahugit/Tunngasugit), Irish (Gaelic) Fáilte, Tá fáilte romhat (sg) / romhaibh (pl), Fáilte romhat isteach! (Welcome here! ), Cead míle fáilte (hundred thousand welcomes), Italian Benvenuto (sg-m) Benvenuti (pl-m), Benvenuta (sg-f) Benvenute (pl-f), Japanese ようこそ (yōkoso), Javanese Sugeng rawuh, Jèrriais Séyiz les beinv'nu(e)(s)!, Kannada ಸುಸ್ವಾಗತ (susvāgata), Kazakh Қош келдіңіз! (Qoş, keldiñiz! ), Khmer ភាស្វាគមន៍ (sohm swaakohm), Korean 환영합니다 (hwangyong-hamnida), Lao ຍິນດີຕ້ອນຮັບ (nyín dee), Latin Salve, Latvian Laipni lūdzam, Limburgish Wilkóm, Lithuanian Sveiki atvykę, Lojban coi ro do, Luxembourgish Wëllkomm, Macedonian Добредојде (Dobredojde) – inf, Добредојдовте (Dobredoydovte) – frm, Malay Selamat dating, Malayalam സ്വാഗതം (swagatam), Maltese Merħba, Manx Failt, Failt royd, Māori Haere mai / Nau mai, Marathi स्वागत आहे (svāgat āhe), Mikmaq Weltasualuleg, Mongolian Тавтай морилогтун (tavtai morilogtun), Nepali स्वागतम् (swagatam), Norwegian Velkommen, Occitan Benvengut! Benvenguda! Planvengut! Planvenguda!, Persian (khosh amadid) خوش آمدید, Polish Witam Cię (Sg>Sg) Witamy Cię (Pl>Sg), Witam Was (Sg>Pl) Witamy Was (Pl>Pl), Witam (Sg>Any) Witamy (Pl>Any, Witaj (Any>Sg) Witajcie (Any>Pl), Portuguese Bem-vindo (>m) Bem-vinda (>f), Bem-vindos (pl), Punjabi ਜੀ ਆਇਆ ਨੂੰ। (jī āiā nū̃), Romanian Bun venit / Bine ai venit, Russian Добро пожаловать (Dobro požalovat'), Samoan Afio mai / Susu mai / Maliu mai, Sardinian Bene bennios, Scottish Gaelic Fàilte, Ceud mìle fàilte, Serbian Добродошли (Dobrodošli! ), Sesotho Kena ka kgotso! (sg) Kenang ka kgotso! (pl), Shona Mauya, Sicilian Binvinutu, Slovak Vitajte, Slovenian Dobrodošli, Somali Soo dhowow, Spanish Bienvenido (sg) Bienvenidos (pl), Swahili Karibu, Swedish Välkommen (sg) Välkomna (pl), Tagalog Maligayang pagdating / Mabuhay, Tahitian Maeva / Manava, Tamil வாங்க (vaazhga), Telugu సుస్వాగతం (susvāgatam), Tetum Ksolok Bodik Mai / Bemvindu, Thai ยินดีต้อนรับ (yin dee dtôn ráp), Tigrinya ገንዘብካ (genzebka - lit: it is yours), እንቋዕ ብደሐን መጻእካ (ənqwaˋ bdeHen meSaəka) Literally: wonderful that you have arrived safely, እንቋዕ ብድሐን ጸናሕካ (ənqwaˋ bdeHen SenaHka) Literally: wonderful that you have stayed well (response to above), Welcome Talitali fiefia, Tongan Hoş geldin (sg) Hoş geldiniz (pl/frm), Ukrainian Ласкаво просимо (Laskavo prosymo) Вітаємо (Bitajemo), Urdu (khush āmdīd) خوش آمديد , Uzbek Xush kelibsiz, Venetian Benvegnù / Benvegnesto (sg-m) , Benvegnùa / Benvegnesta (sg-f), Benvegnùi / Benvegnesti (pl-m) , Benvegnùe / Benvegneste (pl-f), Vietnamese Hoan nghênh / Được tiếp đãi ân cần, Volapük Vekömö, Walloon Benvnuwe, Welsh Croeso / Croeso cynnes iawn, Xhosa Siya namkela nonke, Yiddish sg (Borekh-Habo) ברוך־הבא, pl (Brukhim-Haboim) ברוכים־הבאים, Yorùbá Ẹ ku abọ, Zulu Ngiyakwemukela (sg) Ngiyanemukela (pl). Hello and Welcome to the Town House, Lower Gardiner Street, Dublin. On our cover sheet we have endeavoured to welcome everyone in the language of their respective country, if we have not included your language please let us know. 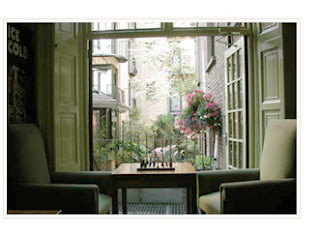 Established in 1978 The Town House has a long standing commitment to the comfort of our guests. The Town House offers you a unique range of bed and breakfast accommodation in a relaxing, comfortable and friendly atmosphere. The Town House is structurally linked with the internationally recognised Globetrotters Hostel. Wi-Fi is freely available and a modern comfortable area has been set aside for those guests who wish to browse the web. We also have an enclosed garden retreat for anyone wishing to enjoy breakfast in the open air or simply to sit quietly with a coffee and good book. The Town House is located in the heart of historic Dublin, a short walk from the world renowned Trinity College, the second oldest university in Europe and home to the Book of Kells, fashionable shopping streets such as Henry Street, O’Connell Street and Grafton Street, the internationally renowned cultural capital of Ireland Temple Bar, the International Financial Services Centre, the O2 Arena, National Conference Centre, Croke Park home of the GAA, Aviva Stadium home to international rugby, museums, art galleries and a myriad of pubs and restaurants. At the Town House we want to make your stay in Dublin as enjoyable as possible and for this reason we have compiled some information that we hope will help guide you to some of Dublin’s best loved Historical, Cultural, Architectural and Traditional venues and sites. Please use the interactive Map at the bottom of this Blog. Dublin can be expensive, and so in our tradition of providing quality service and value for money, we are going to point you in the direction of some places, events and activities that are FREE to view and do. Before leaving the Town House, check the location of the venues described in our tour guide, on the interactive Map at the bottom of the Town House Blog. 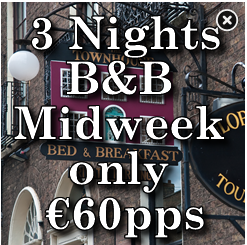 The Town House is based in the heart of Dublin; The Town House is a short walk from Temple Bar. Temple Bar is without question the pulsating heartbeat of Dublin’s traditional and cultural heritage. Temple Bar (Barra an Teampaill) is an historical area on the south bank of the famous River Liffey in the heart of Dublin the capital city of Ireland. Temple Bar is steeped in history and it has preserved its medieval street pattern, with a maze of narrow cobbled streets that are inter-linked. One does not exaggerate to say that Temple Bar is the pulsating heartbeat of Dublin’s culture and tradition, from lunch time each day many of the traditional Irish pubs in Temple Bar echo to the sound of live traditional Irish music. Traditional Irish stew sits easily alongside international cuisine in the many fine pubs, restaurants and hotels. The Italian Corner Restaurant is highly recommended. The area is the location of many Irish cultural institutions, including the Irish Photography Centre (incorporating the Dublin Institute of Photography, the National Photographic Archives and the Gallery of Photography), the Ark Children's Cultural Centre, the Irish Film Institute, incorporating the Irish Film Archive, the Temple Bar Music Centre, the Arthouse Multimedia Centre, Temple Bar Gallery and Studio, the Project Arts Centre, the Gaiety School of Acting, as well as the Irish Stock Exchange and the Central Bank of Ireland. To see pictures and reviews of many of these places of interest go to templebardublin.blogspot.com this Blog is a work in progress and you are welcome to contribute to the Blog by way of comments, reviews or why not write an article about one of the places you have visited. Temple Bar has many great pubs, restaurants and night-clubs for you to enjoy. The Mezz Bar at The River House Temple Bar, The Oliver St John Gogarty Pub in Temple Bar, the area is a major centre for nightlife, with many tourist-focused nightclubs, restaurants and bars. Pubs in the area include The Porterhouse, the Turk's Head, the Temple Bar, Czech Inn (in the former Isolde's Tower), the Quays Bar, the Foggy Dew, Eamonn Doran's, The Merchants Arch Bar and the Purty Kitchen but to mention some. Two squares have been renovated in recent years — Meetinghouse Square and the central Temple Bar Square. The Temple Bar Book Market is held on Saturdays and Sundays in Temple Bar Square. Meetinghouse Square, which takes its name from the nearby Quaker Meeting House, is used for outdoor film screenings in the summer months. 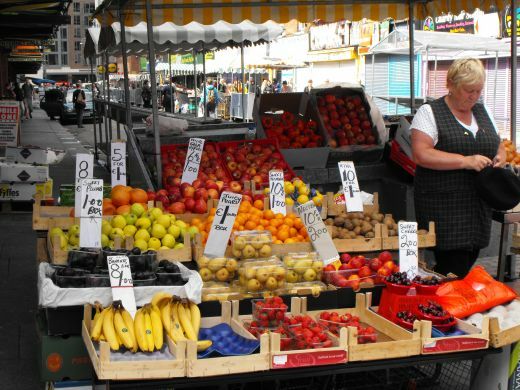 Since summer 2004, Meetinghouse Square is also home to the Speaker's Square project (an area of Public speaking) and to the Temple Bar Food Market every Saturday. The Cow's Lane Market is a fashion and design market which takes place on Cow's Lane every Saturday. These events are FREE. O’Connell Street is Dublin’s main Street and is home to internationally recognised houses of fashion and high street shopping. O’Connell Street is dotted with café/bars, eating houses and fine Irish pubs such as Madigans, a traditional Irish pub in every sense of the word, the pints are great and compliment the Irish Stew beautifully, the service is world class and the prices are keen. Cinemas, theatres, bookshops and the world famous market stalls of Moore Street are all at hand. Easons book shop on O’Connell Street can be a great place to spend an hour browsing the book shelves, downstairs there is a nice seated area where you can purchase a tea or coffee and enjoy a good read. Having relaxed and enjoyed the tranquillity and history of the Garden of Remembrance you may wish to visit the Hugh Lane Gallery, Parnell Square North, that is only a step away from the Garden of Remembrance (entry FREE). 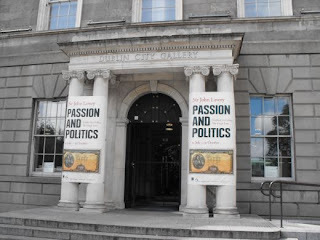 The Hugh Lane Gallery has many wonderful exhibitions and is a cultural delight. 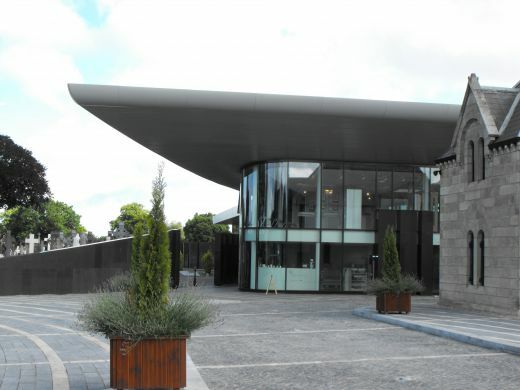 The exhibitions change regularly and so inquiries may be made at the reception desk where staff are always eager to assist or phone +353 1 222 5550. Now you may think this a strange thing to say, but one of the most fascinating and FREE places to visit in Dublin, is Glasnevin Cemetery. Glasnevin is a twenty-minute walk from Parnell Square (Click on Map) and those interned there include the leaders of the 1916 Irish Rising. The Glasnevin Trust has recently opened a Museum and coffee shop at the cemetery and the information contained here is fascinating, including a life size model of grave robbers at work in the days when bodies were robbed for medical science. Having relaxed and soaked up the scholarly atmosphere at Trinity you may wish to walk up Grafton Street and enjoy the traditional busking by musicians, magic men, jugglers and street actors, not forgetting to have your picture taken with Molloy Malone and her famous wheel-borrow. Browne Thomas and all the big High Street names can be found in Grafton Street; however, it does tend to be expensive so keep impulse buying to a minimum. At the top of Grafton Street you will find Stephen’s Green (entry FREE), Stephen’s Green is an Oasis in the heart of a desert of commercialisation, its beautifully designed garden including ponds, band-stands and floral array are second to none in the world. Walk at your leisure through this landscape of manicured greenery and colour exploding tapestry of cascading floral delights. Having walked to exhaustion in Stephen’s Green it is time to head back towards Temple Bar, and here is a personal recommendation, walk down to O’Connell Bridge turn left down the south bank of the Liffey and enter The Merchants Arch Bar, and enjoy a well-earned meal with a glass of your favourite tipple. The service at The Merchants Arch Bar is first class. Having enjoyed your meal and a couple of drinks you may wish to retire to your accommodation for a short break. Later in the evening you may wish to enjoy a movie at one of the local cinemas, a play at the theatre or simply a few drinks, great craic and traditional Irish music in any of the array of traditional Irish pubs in Dublin. If you are looking for some late night Clubbing there is plenty to choose from, however, if you are going out at night, please be safe, stay in the company of friends and never travel alone. Dublin has a population of over 2 million people and is no different from any other capital city in the world. From the Iveagh Gardens one can also look through the Georgian steel gate to the Garden at Staunton’s on the Green. This garden was tastefully designed and created by Irish Artist and Writer V.P. McKenna in 2006 following the building of an extension to Staunton’s on the Green. Staunton’s on The Green is a well maintained Georgian Guest House with a modern 14 bedroom extension. Chester Beatty Library, Dublin Castle, Dublin 2 (entry, FREE), described by the Lonely Planet as not just the best museum in Ireland, but one of the best in Europe, the Chester Beatty Library, Dublin is an art museum and library which houses the great collection of manuscripts, miniature paintings, prints, drawings, rare books and some decorative arts assembled by Sir Alfred Chester Beatty (1875-1968). The Library's exhibitions open a window on the artistic treasures of the great cultures and religions of the world. Its rich collection from countries across Asia, the Middle East, North Africa and Europe offers visitors a visual feast. Chester Beatty Library was named Irish Museum of the year in 2000 and was awarded the title European Museum of the Year in 2002. Egyptian papyrus texts, beautifully illuminated copies of the Qur'an, the Bible, European medieval and renaissance manuscripts are among the highlights of the collection. In its diversity, the collection captures much of the richness of human creative expression from about 2700 BC to the present day. Dublin Castle, Dame Street, Dublin, (All sites under the management of the Office of Public Works are FREE on the first Wednesday of every month, this will be reviewed in December 2011) since its foundation in 1204 Dublin Castle has been at the heart of the history and evolution of the city. Today, spanning an area of over 44,000 square meters (11 acres), the site contains 2 museums, 2 cafés, an international conference centre, 2 gardens, Government Buildings and the State Apartments which are the most important state rooms in the country. The grounds of the site are free to explore, as is the Chapel Royal, the Chester Beatty Library, the Garda Museum and the Revenue Museum. Access to the State Apartments is by guided tour only and tickets may be purchased from the Apartments in the Upper Castle Yard. War Memorial Gardens, Islandbridge, Dublin 8 (entry, FREE), these gardens are one of the most famous memorial gardens in Europe. They are dedicated to the memory of 49,400 Irish soldiers who died in the 1914-1918 war. The names of all the soldiers are contained in the beautifully illustrated Harry Clarke manuscripts in the granite book-rooms in the gardens. These gardens are not only a place of remembrance but are also of great architectural interest and beauty. They are one of four gardens in this country designed by the famous architect Sir Edwin Lutyens (1869-1944). The others being Heywood Gardens, Lambay Island and those in Howth Castle. Dion Boucicault (pronounced Boo-seek-O) lived in the Town House in the 1830's (the house was built about 1808). He was a flamboyant character by any standards. Immensely famous and wealthy (he made £500,000 on one play alone) at the peak of his career. He married three times and died broke! (I'm only reporting the facts!) He was prolific. He wrote more than 150 plays - as well as acting and directing many of them. In The Town House lobby you will see many of the original Playbills and posters for his plays. For example, The Shaughran (an Irish language term for a good natured bowsie who always seems to outwit his detractors and land on his feet) first opened in the famous Wallack's Theatre, in November 1874. You'll see posters (over reception) for productions in London's National Theatre in 1990, and the Sydney Opera House Theatre in 1995. Still enjoying rave reviews after 120 years! There's so much to report about Boucicault that it's difficult to condense into a short pressay. Richard Fawkes has written his most comprehensive biography - Quartet Press. 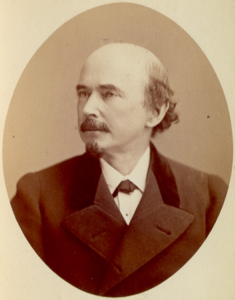 Born in 1829, Dionysius Lardner Boucicault was one of the great dramatists of the Victoria era. He also pioneered the role of the theatre director and was responsible for many innovations in stagecraft, making him an influential figure of the theatre in Ireland, England and America. His spectacular quarrels with colleagues, his passion for women and his making and losing fortunes caused scandal during his lifetime and continue to make him fascinating a hundred years after his death. No.47 Lower Gardiner Street was his childhood home (his birth is shrouded in mystery). Later he ran away to become an actor and was a successful playwright by the time he was twenty-one? Indeed he was a significant influence on Wilde, Shaw, Synge and O'Casey. It was O'Casey that remarked 'Shakespeare's good in bits, but for colour and stir give me Boucicault'. But Boucicault didn't care who he offended and he had enemies enough to do him down. However, after his bigamous marriage to Louise Thorndyke even his friends decided to ostracize him. And therein lies the reason that he is not better known today. It’s as though there was a conspiracy during his later life to ignore his very existence. Jim Connolly, artist and sculptor, remembers him at his flamboyant best. His half size bronze statue that stands by the lift in the lobby captures Boucicault in his finest regalia (he spent thousands on clothes). Lafcadio Hearn is almost as Japanese as haiku. Both are an art form, an institution in Japan. Mr. Lafcadio Hearn...or better known to his Japanese friends as Koizumi Yakumo, was born of Irish-Greek parentage in 1850, on the Ionian Island of Lefkas. In 1851, when Charles Hearn (an assistant Surgeon in various regiments) was assigned to the West Indies, he sent his wife and infant son, Lafcadio, home to his mother in Dublin, Number 48 Lower Gardiner Street. Rosa, Lafcadio's mother did not speak English and was treated very much as an alien by the conservative Hearn family. In 1853 Charles returned home from the West Indies, but relations between him and Rosa were strained, in turn leading her to return to her native Greece in 1854, leaving behind her son whom she was never to see again. 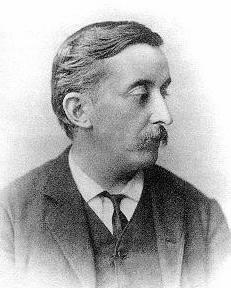 Throughout the next 40 years, Lafcadio Hearn's life was to remain as tragic and unstable as his beginning years, moving from Ireland, England, France and America. It was while in America that Lafcadio took the assignment with the newspaper "Harper's" that led to his first glimpse of majestic Fujiyama, Japan, 1890. Subsequently he married a Japanese lady, took a Japanese citizenship and adopted the name "Koizumi Yakumo". As a journalist and writer he poured out book after book about the land of his adoption. Through his keen intellect, poetic imagination and clear style, he became the great interpreter of things Japanese to the West. It was in 1904, after, as some would say possibly his best work "Japan, an attempt at Interpretation" that Lafcadio died of a heart attack aged 54. The renewed interest in Hearn and his works, a hundred years later, is an acknowledgement of his interpretation skills of the inner life of Japan for the west and the west of Japan. He remains today as a popular literary figure and adopted son of the Japanese people, of whom many are welcome to see the beginning of a great man at the Townhouse, 48 Lower Gardiner St., Dublin. We have a wide variety of rooms. Spacious accommodation, the Townhouse has over 80 private rooms, some with private balconies overlooking a beautiful Japanese Garden, others enjoying Georgian sash windows with views of the surrounding cityscape. Most have private bathrooms. All rooms include multi-channel television, telephone and tea and coffee facilities. All of our double rooms have freshly laundered white bed linen and all rooms are serviced daily. The mixture of double and twin rooms each with comfortable white bed linen, some with complementary Wi-Fi, multi-channel television, telephone and tea and coffee making facilities make the Townhouse a very enjoyable experience, each room provides an in room safe and hairdryer. Enjoy a restful and productive stay in an atmosphere blending tradition and technology. Each of our single rooms are decorated to a unique style boasting the modern convenience you should expect from a beautiful Georgian building. Amenities include multi-channel television, telephone, and tea and coffee facilities. All single rooms are en-suite and boast freshly laundered white bed linen. Some of our singles enjoy a private balcony overlooking a Japanese Garden full of beautiful greenery.